The Blackpool Elk is also known as the Carleton Elk, the Highfurlong Elk and the Poulton Elk. 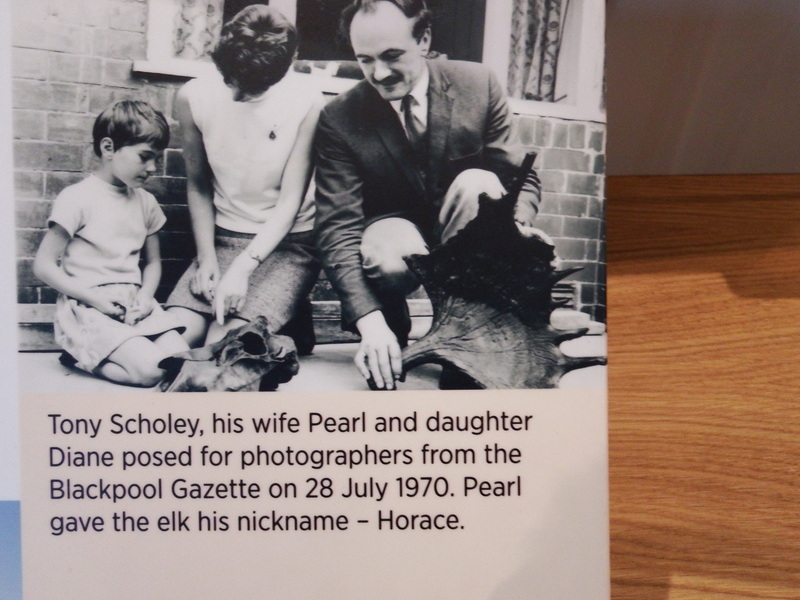 In July 1970, Mr Eric Scholey was looking through the window of his bungalow at Blackpool Road, Carleton. Next door foundations were being laid for a new bungalow. He saw some large bones. He put them in his garage. Since he was interested in archaeology he contacted friends and eventually the County Archaeologist. When an archaeological survey was done of the site it also discovered a dog skeleton, a dead pet . Of more interest was the skeleton of an elk. An elk is related to the moose and is now found in northern Europe. 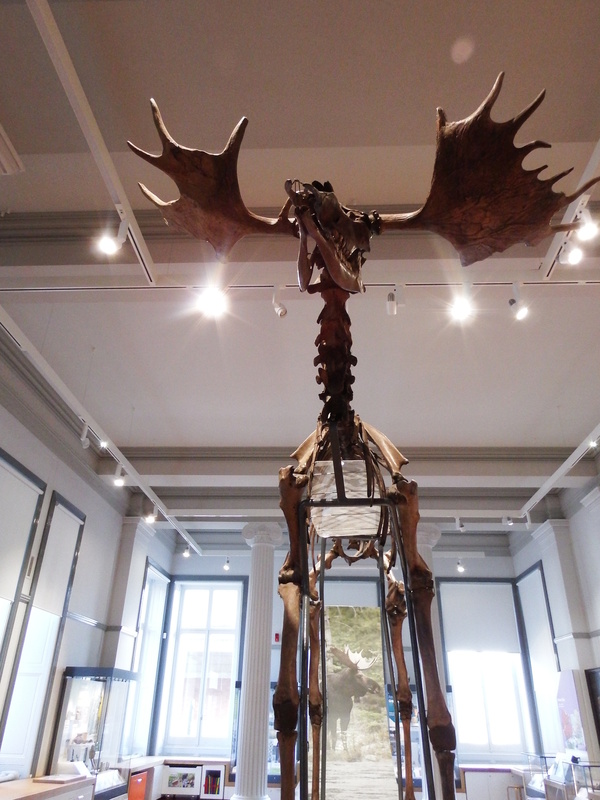 The skeleton was a full grown moose in the prime of life, about four years old. Because of the state of its antlers we know it died in Winter. This moose weighed 650 pounds. Mr Scholey displayed the bones for his neighbours and an archaeologist was disconcerted to see one of them trying to make off with a bone. A nourishing stew? Something for the dog? It had been in the ground for 13500 years. Imagine a generation is 25 years. Jesus walked the earth 80 generations ago. The elk walked the land between Blackpool and Poulton 540 generations ago. The Elk had injuries, it been wounded in an earlier encounter and escaped to be hunted again days later. The Elk was wounded but escaped on a frozen lake. 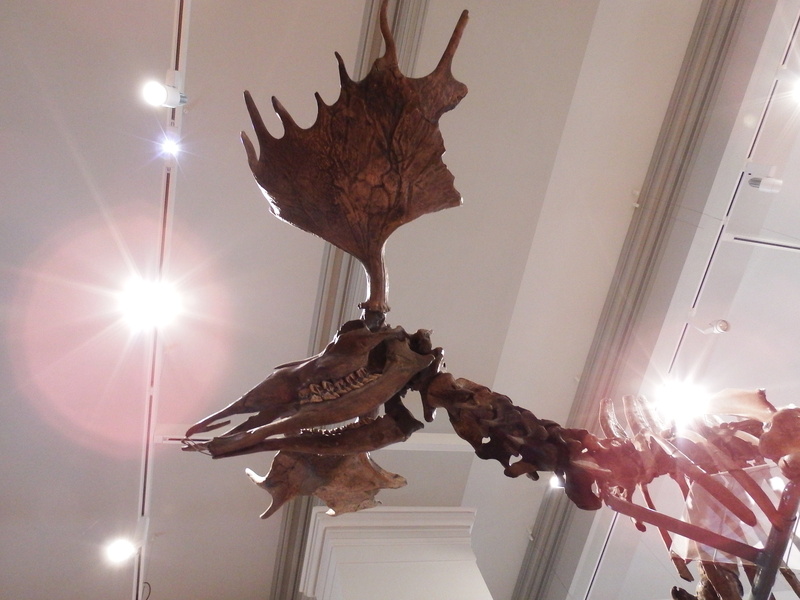 The the ice gave way and the Elk was covered in peat which preserved the skeleton. Two edged lances were found. One wounded the Elk in its leg. The other was close to the skeleton. Archaeologists found evidence of flint tipped arrows and other weapons such as stone axes being used. The bow used at that time was the most powerful weapon on this planet for thousands of years. The edged barbs used to hunt the Elk. Carved from bone or horn the edges are shaped so that the barb remains in the victim. It is strange to think that these were carved by our ancestors within miles of Blackpool. 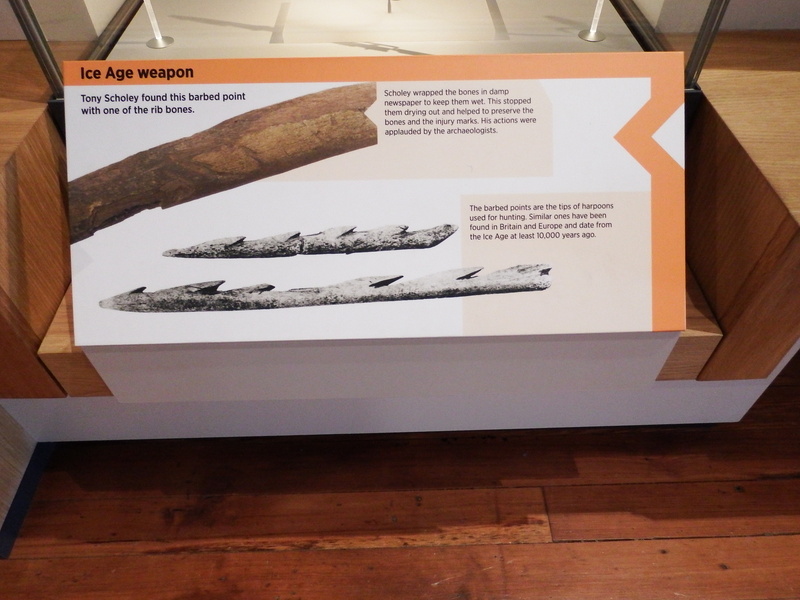 The people were Mesolithic Hunters. They lived by water. They had a life expectancy which was not passed until the 19th Century. Their diet was better than ours. They had bigger brains than we do. They were like Olympic Atheletes combined with MBAs. They had to carry knowledge and skills in their slightly larger brains. I find the bigger brain surprising. Modern life allows many dopey people to survive (such as me) where a dopey Mesolithic person would not. Or we use our brains more efficiently. Domestic animals have smaller brains than their wild ancestors possibly we have domesticated ourselves. Hunting was important but the diet included many kinds of herbs, nuts, fruit, birds, eggs, fish and shellfish and many kinds of animals . A water-side setting offered access to many kinds of food. What were they like these first Blackpool Residents? We know from two main sources. One is studies of hunter-gatherers that survive in places like the Amazon. And the other is from the archaeological evidence from Star Carr near Scarborough where a Mesolithic site has been excavated. The hunter gatherers that exist today are influenced by other communities and live in marginal land so they are different from the Elk Hunters. Hunter gatherers are collective people. Possessions have to be carried so they are limited and purposeful. They are friendly and generous but will kill children, old people and sick people with disconcerting nochalance in some circumstances. They live in a more equal world than we do. There is an argument about whether they were monogamous. Surprisingly early societies did not understand how babies came about. Children were thought to belong to the whole band. Most likely some bands were monogamous and some carried on like teenagers at a rock concert. There was a low birth rate and the Aborigines of Australia maintained a stable population until Europeans came and killed most of them. You may think I’m exaggerating but the Aboriginal population dropped by 90%, in Tasmania where Aborigines had lived for 40000 years a hundred years passed between the first European stepping ashore and the last Aborigine dying. At that time the Polar Ice Cap had begun to recede Northwards and the Fylde was a plain punctuated by lakes. The biggest lake, Marton Mere, was gouged out by a glacier. The sea level was lower and England was joined to the continent. The sea was many miles to the west. The Elk Hunters were among those who returned as England emerged from an Ice Age which had covered the land with up to a kilometre of ice. Europeans had fled the ice to a redoubt in Spain. The homo sapiens population had come close to extinction. It is because homo sapiens developed from populations close to extinction that there is more genetic variation in a field of cows than there is in global homo sapiens. The most jaw-dropping find at Star Carr were the deer helmets. 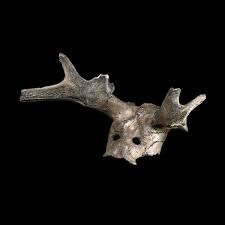 These were made from the skulls and horns of deer that had been shaped so that they could be worn. 21 sets were discovered. Hunter gatherers are Animists. Animists do not believe in an all powerful God. They believe that animals, trees, streams, rocks, mountains have a spirit. That spirit can help or hinder us. We are not different from animals and rocks and trees. We are part of them. To us it appears radically daft that the deer should be an object of reverence because the hunter gatherers kill and eat them. People who eat bacon sandwiches do not usually worship pigs. But the deer was food and food is life. Bread and wine, central in Christian worship symbolise food and life. There is an idea of something sacrificed to give life. The hunter gatherers may have been grateful to the deer that they killed and ate. On the other hand they may have just stuffed themselves with magic mushrooms and danced about and thought it was cool to wear horns as a kind of Mesolithic discotheque. More likely the wearing of horns were part of a religious ritual. 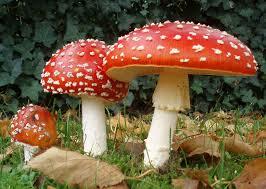 The hunter-gatherers will have known of psychedelics, probably mushrooms. Only one culture has been found that does not use drugs. Mushrooms play a major role in Sami Culture in Lapland which is close to Mesolithic culture has connections with Father Christmas and reindeer. There is a claim that the red and white costume of Father Christmas comes from the red and white worn by Sami shaman and based on fly agaric the hallucogenic mushroom used by the Sami. We have strayed a long way from Mr Scholey finding the bones. The place we pass on our way to the Sixth Form College or Carleton Crematorium was where our ancestors hunted Elk. Have all these bones got anything to do with the findings at Star Carr which date from two thousand years later? We don’t know. The Star Carr hunters and the Elk Hunters had the seem tool kit, probably they had the same beliefs. And a figure crops up. 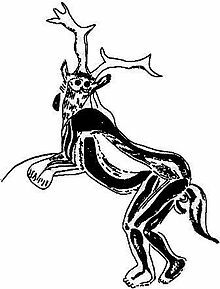 This is a drawing of a figure from a cave painting slightly later than the time of the Elk Hunters. It is called “The Sorcerer” Like everything else in archaeology the interpretation is disputed. Some think it is a man dressed as a deer or a combination of a man and a deer. One writer has said that it is the first representation of God. I have included it to show how readily man could see himself as deer. It came from a different culture from the Elk Hunters. Did the first Blackpool residents dress up in deer helmets and dance about on Warbreck Hill? We haven’t got the foggiest clue. There are two pieces of evidence that it is just within the bounds of possibility. One is that a wooden construction was found when Penwortham Marsh was drained to build Preston Dock in the 19th Century. It could have been the kind of platform that was found at Star Carr. Flint instruments, animal bones and antlers were found at Skippool Creek. The site was still marked on 1930s OS maps. Could they have been fashioned for wear? Both are lost we cannot know. Modern man, homo sapiens, has been on this planet for 200000 years. Farming started 12000 years ago and has not reached some places. Scratch an estate agent and you find a farmer, scratch the farmer and you find a hunter gatherer. Hierarchy is necessary in a agricultural or post agricultural society. It doesn’t matter who fills the places. Waterloo was won by officers selected on the basis of wealth. Any hierarchy will do but you have to have one. In our hearts we all know that our bosses are thick, lazy and useless. This may be because they are but it is also because we have a visceral sense of equality and that hierarchy is really a fraudulent nonsense devised to rob us. This sense is sporadic and incoherent and bursts out in irreverence and mockery, and violence. I adore the Valley of the Workers near Luxor where the craftsmen who built the tombs for pharohs parody the wall paintings with surreal fantasy animals. People are aware that hierarchy is nonsense and that it is necessary. Rebelliousness is part of our equipment. The people who hunted the Elk were a team and a team is the working unit of hunter gatherers. Think of all the games we play: football, tennis, golf. They depend on hand eye coordination the crucial skill of Mesolithic Hunters. They also often depend on cooperation. They often take place outdoors. When we are absorbed in crafts like Mesolithic Men fashioning barbs from bone or clothes we are sometimes at out happiest. When we are just walking observing closely the world about us, when we are birdwatching or watching TV about the natural world we are in the world of the Mesolithic Hunters. Hunting and fishing capture the joy of interacting with the natural world. People have a fondness for water-side settings. Blackpool owes its existence to this affection. Consider the life of a mill-worker or a civil servant or somebody who works in MacDonalds. Their work is repetitive and boring and profoundly unnatural. To be alive is to have a nagging sense of discontent. At about the same time that the Elk was being killed Man began his first experiments with growing wheat in Turkey. When Europeans tried to explain the joys of farming to Aborigines the Aborigines laughed. “Why should we do all this when we have all we want in abundance?” Farmers always win because they have numbers. We have made a Mephistolean Pact. More production supports a bigger population which produces more which supports a bigger population which needs to increase production. Was the Farming Revolution a good idea? We do not know the answer yet. You can see the Elk in the Harris Museum in Preston. After 13500 years underground it is stared at by Preston schoolchildren. When I saw it I had a sense of falling, a feeling close to panic but also elation. Awe and wonder, time and fate….